Three words. One trip. Sally Davis’ Rio Adventure. West Ottawa alumna Sally Davis walked down the stairs of the tiny airplane into the stunning city of Rio. She could not wait to embark on her adventure as a volunteer at the summer 2016 Olympics. As she came off the plane into the overheated city of Rio, she looked out and saw the beautiful vegetation, feeling the excitement that filled the air. “The Olympic spirit was everywhere,” Davis said as she stepped foot onto the Olympic property. She believed this was where she was supposed to be. Breathing in the fresh air of Rio made her even more excited for what the next few weeks had ahead for her. Davis sums up her time in Rio in three words, two of which are predictable and one that is a surprising truth. International: “Everyone I met was from a different country, even some I’ve never heard of. It was amazing! We had to communicate with few words but still all worked together. It’s a beautiful thing,” Davis said. Even though she didn’t have much communication with the athletes, Davis was still amazed at how well all the countries worked together and supported each other. Harmony: “This goes along with the first. But it made my heart so happy to see so many different nations and people who come from completely different backgrounds of every kind come together and put on such a successful event. This goes from the volunteers, like me, all the way up to the officials and the Olympic committee. It was absolutely heart warming,” Davis said. Davis enjoyed seeing everyone all over the world come together to put on an amazing event. Without all the different cultures or countries, the Olympics would not have been as successful. Festive: “It was such an energetic time in Rio. Everybody was happy, and enjoying the Brazilian culture and people. The Olympics were competitive but I noticed a lot of support from all the teams. In golf,1 where I volunteered, everyone would cheer if someone had a great shot or hole in one, not only if it was the country they were supporting, but they would cheer on other countries too. I know I had such a fun and festive time too, embracing everything,” Davis said. The attitude and energy in Rio were one of the things that made Davis enjoy her experience so much more. 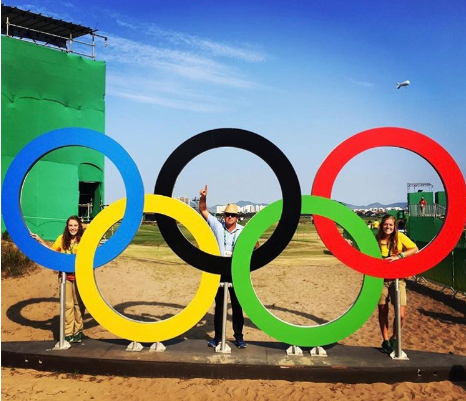 During her time volunteering in golf, she experienced a lot of amazing things that she never knew happened in the Olympics. Davis was amazed by how much the other teams supported and enjoyed being around each other while competing against one another. While her time there she astonished by how friendly, yet competitive the Olympic spirit was. Davis and many others ware surprised at how even though they couldn’t all fully communicate, they would cheer and get excited over the little victories of even the opposing team. With seeing all the teams come together she was moved by the amount of love that was shown between countries. Davis talks about how the volunteers and other employees couldn’t always understand what other teams were saying. Even though that may have been frustrating at times, the Olympics was still put on with great excellence. With the teamwork of everyone there they were more successful then Davis would have thought if she hadn’t gone. As the other two adjectives were quite predictable, what Davis had to say about “Festive” was a surprising truth for her. Davis was very honored to have had the opportunity to be apart of such a life changing event. Davis will always remember these words and how they supported her trip, yet she will always look back on “Festive” and how much of an impact it had on her experience. Content and multimedia content © 2019 The West Ottawan. All rights reserved.